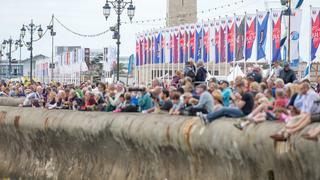 Even Sir Ben Ainslie couldn’t have dreamed that close to 100,000 spectators would turn out to watch him compete in the first official America’s Cup racing since that incredible finale almost two years ago in San Francisco. Ainslie and his Land Rover BAR crew weren’t particularly talking up their chances when Ainslie rated his ACWS competition, although they had been hard at work training on the Solent and Southampton Water in 20ft foiling catamarans as well as making best use of limited training time on their foiling AC45F. As with Formula One, where drivers and race teams are required to test and train within a maximum prescribed number of days, the same cost-saving measure applies to America’s Cup teams these days. Although we’ve seen AC45s competing at America’s Cup World Series events in the past, we’ve never seen them on hydrofoils before. So Portsmouth was a first opportunity for the six teams to check in against each other, to find out who was making the early running. 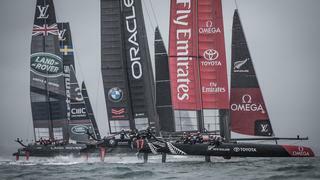 Retaining some of the key squad from the winning America’s Cup campaign of 2013, Oracle Team USA were expected to be strong, with 2012 Olympic Champion in the Laser, Tom Slingsby, calling tactics for long-standing skipper Jimmy Spithill. Artemis Racing has carried on with many of the chief protagonists from San Francisco, with skipper Iain Percy calling the shots for his Aussie 49er Olympic Champions on the helm and wing trim, respectively Nathan Outteridge and Iain Jensen. At the other end of the spectrum, Groupama Team France had only just got on the water a few days before, and realistically the offshore legend Franck Cammas could not expect too much from his scratch crew. The new ACWS format is very compact, with just two races on Saturday and two double-points races to conclude on Sunday. 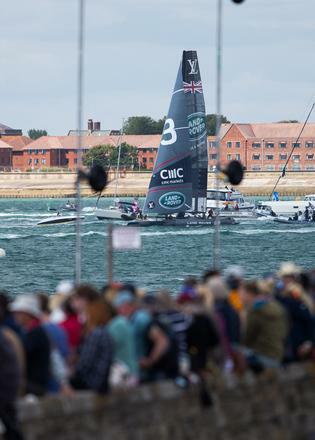 With each race lasting just 30 minutes, Ainslie knew he had better make an impact before the moment was gone. Perhaps that was why in race one on Saturday, with light to moderate breezes and sunny skies, Ainslie positioned his AC45F close to the start line, booking his spot early for a fast reaching start to the first turning mark just 300m away. Trouble, was, Ainslie had left himself no runway for acceleration, as Oracle sped up from behind the fleet and shot through for an early lead. Along with the Brits near the back, Emirates Team New Zealand was a little slow off the line and was the only boat to gybe out to sea at the first mark. It looked desperately slow, but just 30 seconds later the Kiwis had hooked into a gust and they were up and foiling. Meanwhile early leaders Oracle looked dead in the water over by the massed crowd gathered on Southsea waterfront. Ainslie called for the Code 0 gennaker to be hoisted, effectively doubling their downwind horsepower. This is never a popular move with the crew, as hoisting the heavy coil of furled sail is a hard grind and, once it’s up, you can’t guarantee that it’s going to make you any faster. While the Code 0 will speed you up in light airs, as soon as the breeze tips over 10 or 11 knots - hardly a gale - the extra sail turns into extra drag and it’s faster to foil downwind without it. But on this occasion Ainslie’s call was vindicated and miraculously by the first leeward gate the Brits found themselves already up in second place behind the cunning New Zealanders. By the end of the three-lap windward-leeward course, Land Rover BAR had ground their way past the Kiwis and - to the roar of the crowd - Ainslie crossed the line in first place. Meanwhile Spithill had battled his way back through the fleet to steal 2nd place at the finish, just ahead of the Kiwis. In the next race, Ainslie was again early to the line but this time had control of most of the fleet on his windward side. In the final 3 seconds he bore away to accelerate into an early lead. Clearly the Brits had clocked how well the early gybe had worked for the Kiwis in the previous start, so Ainslie carved into a manoeuvre in search of that better breeze further out to sea. But the Kiwis led a charge down the Southsea side of the first run and again showed the fleet the way down to the first gate. As in the first race, Ainslie found himself at the back with nothing to show for his good start. At the front only the French showed any sign of threatening the New Zealand lead, but new ETNZ helmsman, 24-year-old Peter Burling, held on for the win. Meanwhile, chipping their way through the fleet were the Brits who had picked themselves up and taken full advantage of the three laps to get themselves back into the game. They crossed the line in 2nd, and the result was perhaps even more impressive than their win in the earlier race. 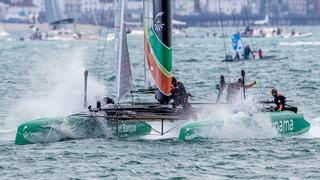 However, Sunday was a very different story, with gale-force winds and big waves forcing racing to be abandoned. The Duke and Duchess of Cambridge had come to visit, but would have to make do with a tour around Land Rover BAR’s brand new, state-of-the-art team base situated close to Portsmouth’s Spinnaker Tower. 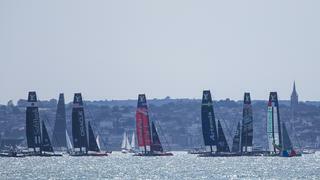 Ainslie was therefore the winner in Portsmouth, just a point ahead of the rejuvenated Emirates Team New Zealand. On the strength of the Kiwis’ performance, Grant Dalton’s decision to replace the 43-year-old Dean Barker with the 24-year-old Peter Burling (who with fellow team member Blair Tuke has an unbroken three-year run of 18 championship victories in the Olympic 49er skiff) looks vindicated. Oracle Team USA bounced back well from some bad positions to finish a close 3rd. How are the rest of the America's Cup team looking after the ACWS? The top three look a step ahead of the rest, although Cammas and the French can be very pleased to have taken 4th overall. Dean Barker has taken up residence as skipper and boss of SoftBank Team Japan, and it’s early days for him and some other former ETNZ team mates along with former Luna Rossa helmsman, Britain’s Chris Draper. The big surprise and disappointment was to see Artemis Racing finishing in last place. With just a month before the next ACWS event in Gothenburg, the Swedes need to pull their socks up if they’re to get anywhere close to matching the impact that Ainslie made on his home crowd in Portsmouth.